Thanksgiving is believed to date back to the Pilgrim Fathers - although they never actually called themselves "Pilgrims" But they did have the first, so-called " Thanksgiving " party or celebration in 1621. This was a secular (worldly rather than spiritual or related to the Church) 3-day harvest festival held sometime between September and November: They dressed plainly in dark clothes and ate wild turkey, venison, seafood, Indian cornmeal, stewed pumpkin, nuts and plums, to offer thanks for their survival (the few that remained). In those days, there was no ham, no mashed potatoes, no pumpkin pie nor cranberry sauce. Do you know someone who could benefit from some special luck at Thanksgiving? Send good luck wishes to a friend, loved-one or work colleague at Thanksgiving . . Help your friends and loved-ones have a great day and achieve success and happiness in the coming year. See SHOP for range of THANKSGIVING gifts. The day of Thanksgiving (and its celebration with a Thanksgiving party or dinner) did not become a national holiday in America until the time of President Lincoln in 1863. Turkey, then as now, was the main ingredient of the Thanksgiving meal or supper (and that tradition continues to this day). 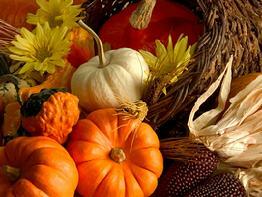 But the cornucopia (another symbol of Thanksgiving) was not so common. Indeed, in the very early (and difficult) days of 17th Century America, it is unlikely that it featured at all. But nowadays, it is the cornucopia that, perhaps more than any other symbol, symbolizes prosperity and well-being at the time of Thanks-giving. The ideal of the cornucopia comes from Greek mythology: Amalthea was the name of a goat who raised Zeus, future king of the Gods on her breast milk. Her horn was accidentally broken by Zeus whilst they were playing together, and so Zeus, in remorse, gave her a new one which had super-natural powers. Amalthea filled the horn with flowers and fruits and grain. And so now, it is said that if you give a gift to someone of a cornucopia (as at Thanksgiving, for example) that that person will get whatever they wish for. In modern representation, the cornucopia is typically a hollow, horn-shaped wicker basket filled with various kinds of fruit and vegetables.